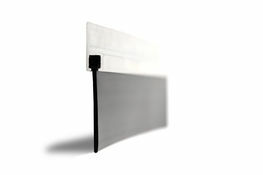 With our excellent rubber blade garage door seals range, you are getting an effective garage door seal. Not only will these rubber blade garage door seals last a long time, but they will do a brilliant job keeping out pests, draughts and leaves, too. With the robust design and efficient rubber seal, you can rest assured that your garage door will be sealed effectively. 40mm rubber blade seal x 2.44m overall length, supplied with 180° aluminium carrier as shown. This product is also available with 90° & 45° carriers if required, for alternative carrier angles please select from the options menu.